From an April 2001 general conference address. Elder M. Russell Ballard sustains the prophet, President Gordon B. Hinckley, and teaches us about the importance of having a living prophet. 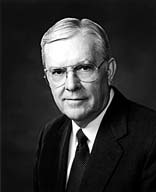 Did you know that Elder Ballard’s grandfathers were both Apostles? I promise you in the name of the Lord that if you will listen not just with your ears but also with your heart, the Holy Ghost will manifest the truth unto you of the messages delivered by President Hinckley, his counselors, the Apostles, and other leaders of the Church. The Spirit will prompt you to know what you should do as individuals and as families in order to follow our counsel, that your testimonies might be strengthened and that you might have peace and joy.